Warm... fuzzy... cabled and pretty. ^^ I love my new socks! 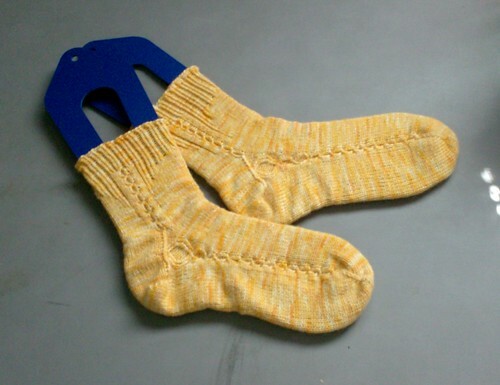 These are the SKA Mystery Sock pattern by Yarnissima, named Kiila (Finnish for 'gusset'). I started them last month and finished them last night, in my hand-dyed cashmerino sock yarn Palladium, in the colorway Canary's Song. I love the way it knit up. I normally don't like to do cables, but the minicables in this pattern were a cinch. The toe-up gusset heel flap fits great, and the gusset looks great to boot. The pattern was just interesting enough to hold my attention, with the majority of the pattern still in stockinette. I adore it. ^^ Thanks Yarnissima for this great pattern! Wow, they not only look fine, but warm the heart too at first glimpse. This is a miracle of the knitting and your sharing (blog post) makes us (your readers) the lucky participants. Pretty socks... this is why I want to learn how to knit! I love pretty soft fuzzy knit socks, way better than mass made crap socks from the local department store, you know? I just can't get the hang of it, the 2 needles and the perling... my brain says quit that it hurts!